Has a strong and diverse back ground in music and is a former session musician who has played Reggae and R&B on a semi professional basis, enjoying a wide variety of music from Reggae, Soca, R&B, Jazz to Salsa, Mambo, Merengue, Zouk and Bachatta etc. Some of his favourite artists are: Jose Alberto, Gilberto Santa Rosa, Tito Puente, Juan Luis Guerra, Louie Ramirez, Rey de la Paz, Oscar De Leon, Africandos, Los Van Van, Manolito Simonet, Frankie Dante to name but a few. 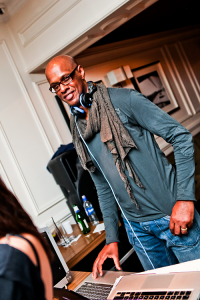 Robert’s experience has a promoter has helped him stand out as a great DJ, being able to play in any multi room venue, Mambo, Salsa Romantica, Salsa Classics, Salsa Dura to Merengue, Bachata, Kizomba. Robert regularly DJ’s at MamboCity events with his team of Djs and at the at some major events around the UK and abroad. Clubs: The original resident DJ at Club SOS for a number of years and Club Havana St Albans. The First New York Salsa Congress 2001, The First German Congress (Darmstadt) 2001, The UK and British Salsa Congresses, Dubai Congress, “Salsa Fusion 2” Dubai, Paris Salsa Congress, Barcelona “Salsa Con Poa” Congress, Norwegian Salsa Congress (Oslo), Berlin Salsa Congress, Croatia Salsa Congress, Pontins and Latin Fest Weekenders. Robert and his wife Jean are also founders of Mambo City, one of the leading promoters of Salsa in the UK.